It isn’t often that I get to show off my Italian heritage in a dessert. Dinner…frequently…but dessert…that would be well, just about never. Never made tiramisu. Never made panettone. Never made cannoli, biscotti, or anything with Giada’s seemingly favorite dessert ingredient, Amaretti cookies. I’m almost ashamed to admit that I’m 50% Italian! Until now. 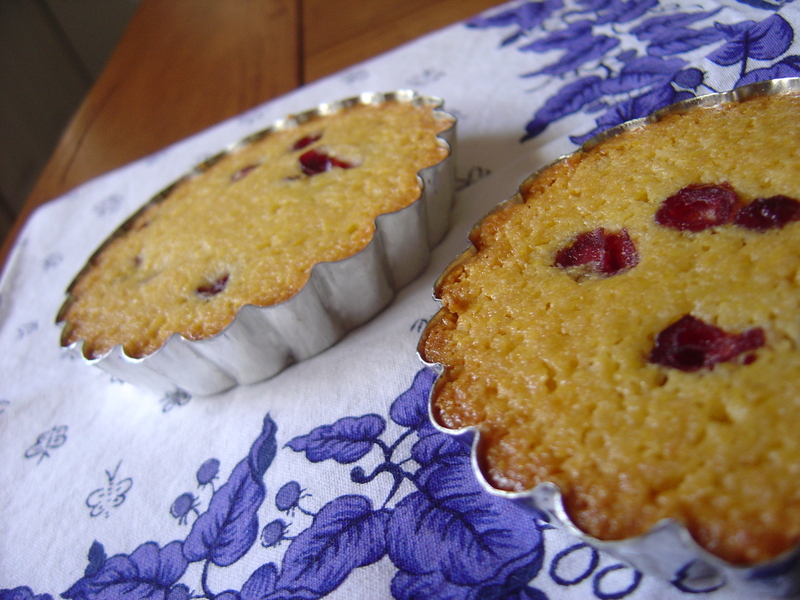 Caitlin, the Engineer Baker, chose this week’s TWD recipe: Fluted Polenta and Ricotta Cake. Now, I must admit that I was highly skeptical of this recipe. Polenta in a dessert? Combined with ricotta? Come on now. However, since I had skipped the previous two weeks of TWD, I had to make this recipe for fear of getting the boot from the group. And boy am I glad I did. While Dorie says that she modified this honey cake, as she calls it, from one she found in a French food magazine, I’d have to lean more towards the notion that there really is Italian food published in French media, no different that what you’d find here in the U.S. This cake was just awesome. It was a perfect combination of sweet with savory and I almost cried after taking my last bite. Thankfully, I halved the recipe and made the cake in 6 mini-tart pans (and baked them at 300 degrees F for 35 minutes) so I actually had portioned leftovers. Whew. A fair amount of sugar and honey went into this recipe and I know that quite a few TWDers ended up cutting down the amount of these vital ingredients but I went balls to the wall (as my dear husband would put it) and kept the original amounts which ended up being the right decision for my taste (and only mine since Kyle is on South Beach and couldn’t actually eat and of my delicious little cakes…too bad for him. lol) . I really feel like the combination of the honey and the lemon zest was a great complement to the savory polenta and ricotta and I didn’t think the sweetness overpowered the cake at all. 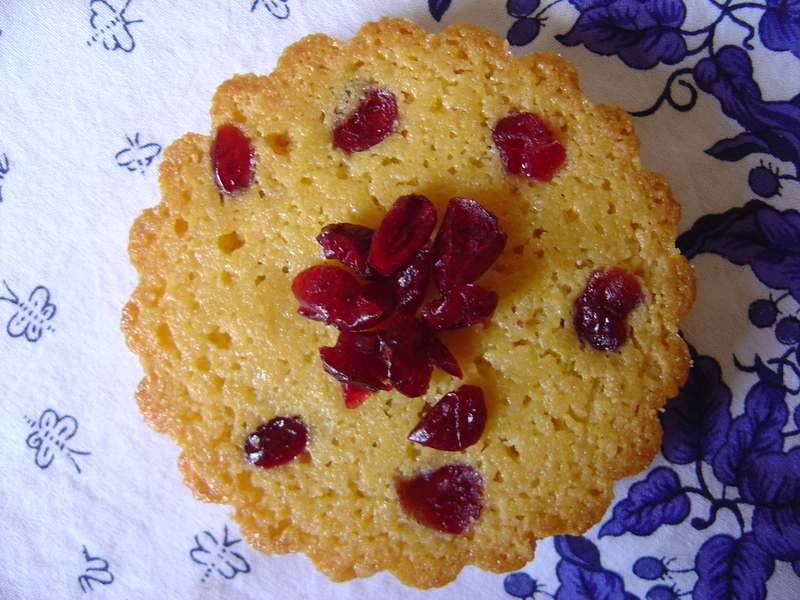 Overall the recipe itself was a cinch to put together and the thought of making little tarts without preparing and rolling out any dough seemed genius to me. I omitted the butter dots on top of the batter because, well, I forgot about them. I couldn’t find any figs (even at Whole Foods – dried or fresh) so I bought dried dates instead. After seeping them in boiling water, I chickened out and reached for the Craisins. I’ve never even eaten a date so I don’t know what I was thinking by putting them in a new recipe. However, after putting the tartletts in the oven, I tasted one of the dates and realized that I will definitely use them the next time I make this recipe. Center a rack in the oven and preheat the oven to 325 degrees F. Butter a 10 ½-inch fluted tart pan with a removable bottom and put it on a baking sheet lined with parchment or a silicone mat. I need to get tartlette pans! Your cakes look great! Way to go! Your tarts are lovely. My preference would lean more toward Giada’s other favorite dessert ingredient: Nutella! They look beautiful! I love the tops….so colorful! Very pretty! I loved this cake too – and after reading so many other TWD posts, I want to try it again and again, with all the different variations people have come up with. Very pretty, and I love using dates in this. I’m glad you got to do the Italian thing, and edgy is a good way to describe this – thanks for going with it! I love the look with the craisins—I might try that next time. I didn’t love the figs in this recipe, but the cake was fantastic. The craisins just pop off the cake. So purdy! Great job! Glad you could reach your Italian side with this. Dates sound so perfect for this! Great job! Your litte tartlette’s are so cute! 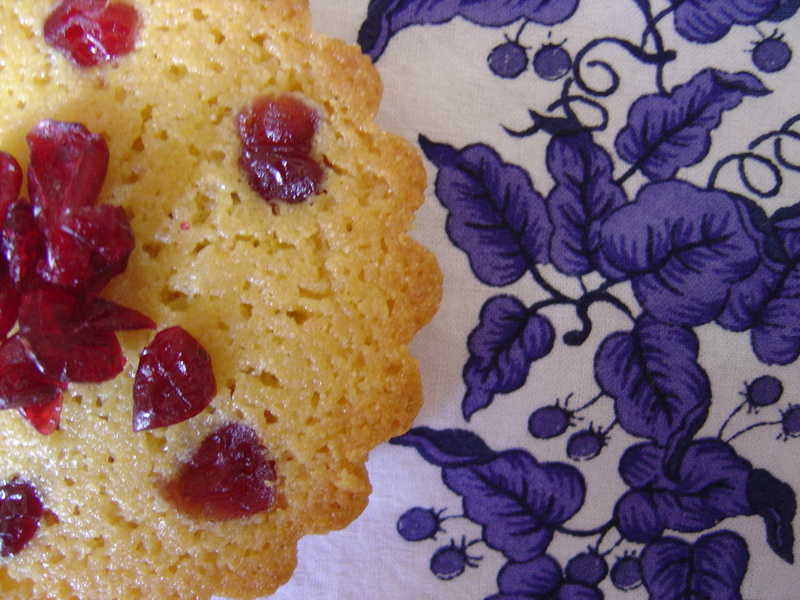 I love the contrast with the yellow cake and the bright red craisins. I’m with Clara, the splash of red from the craisins look beautiful! hey guess what!? you won my Williams-Sonoma Gift Card Giveaway! i’m serious. you can email me with your address and i’ll get it off to you! kate (AT) thecleanplateclub (DOT) net. i’m sure this won’t be the case, but if i don’t hear from you in 7 days, i’ll pick a new winner. Beautiful, it’s nice you got a chance to show off your heritage. I loved this recipe too.